Xi did not appear to have responded directly to the above remark. However the Chinese leader firmly pushed back on Obama’s human rights criticism, warning that reform would come on China’s own timetable and without undermining its stability, reported the AFP Sep 26. “We must recognize that countries have different historical processes and realities, that we need to respect people of all countries in the rights to choose their own development path independently,” Xi was quoted as saying. Besides, reported China’s official Xinhua news agency Sep 26, Xi said the Chinese people were in the process of realizing the Chinese Dream of the great revitalization of the nation, and in essence, it was a process that promotes social justice and advances human rights. In other words, realizing the Chinese dream was in essence promotion of human rights. It added that Xi, nevertheless, expressed China’s willingness to conduct human rights dialogue with the United States based on equality and mutual respect, so as to expand consensus, narrow differences, learn from each other, and make progress together. 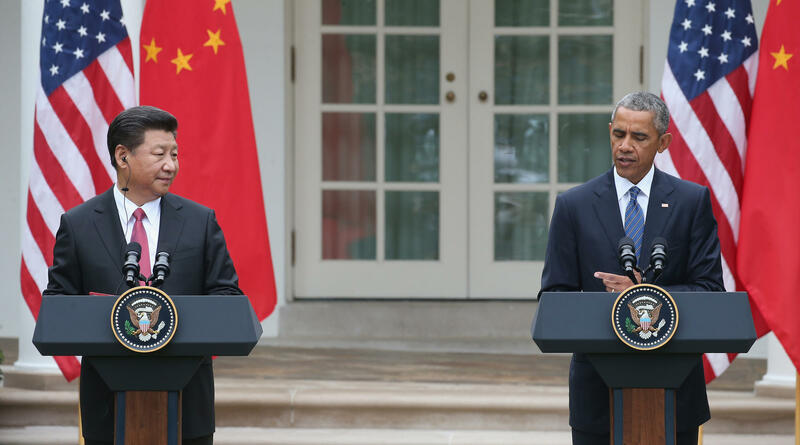 It was an extraordinary news conference at which Obama chided China on its treatment of dissidents and insisted hacking attacks on US firms must stop, even as he thanked Xi for his commitment on climate change, the AFP report said. It added that the red carpet and full ceremonial honors that welcomed Xi to the White House underlined the importance of the great powers’ relationship, but that the leaders made no effort to conceal the differences between them. “I expressed in candid terms our strong view that preventing journalists, lawyers, NGOs and civil society groups from operating freely, or closing churches and denying ethnic minorities equal treatment are all problematic … and actually prevent China and its people from realizing its full potential,” Radio Free Asia (Washington) Sep 25 quoted Obama as saying. During the press conference, the report said, chants could be heard from about a block away from the South Lawn, where more than 200 pro-China supporters and anti-China protesters in two groups were separated from one another by metal barriers and police. The supporters were said to consist largely of Chinese students based in the US and members of Chinese-American associations who waving Chinese and American flags and shouted pro-China slogans, welcoming Xi to the US capital. The report added that the more animated protesters were made up of a variety of anti-Beijing organizations, including ethnic Uyghurs from northwestern China’s Xinjiang Uyghur Autonomous Region, Tibetans and Chinese democracy campaigners. The Chinese president is in New York from Sep 26 to 28 for a series of summits and meetings marking the 70th anniversary of the founding of the United Nations.